Waterman's Cottage - A Chincoteague Island Vacation Experience full of History, Charm, & Wonder! 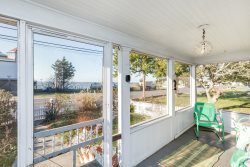 Do you have a second home or investment property on Chincoteague Island or in Captain's Cove but live more than an hour away? Ever have an uneasy feeling after a major weather event or that odd Facebook post about something in your community? Contact Seaside Vacations to learn more about our Property Watch Services. We are happy to keep an eye on your investment, document any damage, and report to you with photos as needed on a monthly basis, after major weather events, or anytime you have that uneasy feeling. Our list of services is comprehensive and is tailored to each individual property. In addition to our short-term rentals, we also have an extensive list of long-term rentals and provide property management services for these properties as well. We use one of the best Property Management Software in the industry, with the ability to handle both short term and long term stays. We can store as many pictures for each property as needed, which is great documentation when security deposit questions arise at the end of a lease. We also have a different philosophy than most - we are hands-on and communicate with the tenant. We do monthly exterior inspections. We also do inspections after storm/wind events. We explain to tenants that we work hard to provide them with clean, comfortable, well-maintained housing and ask them to work with us keeping it that way. We schedule a quarterly interior inspection, which also affords us the opportunity to change the HVAC filters. This improves system performance, keeps their utility bills down, and extends the service life of the system.